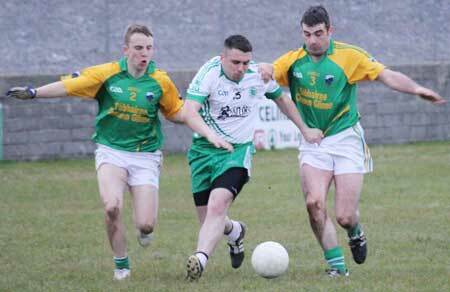 Naomh Columba showed the greater attacking endeavour to earn a deserved away win in Ballyshannon. 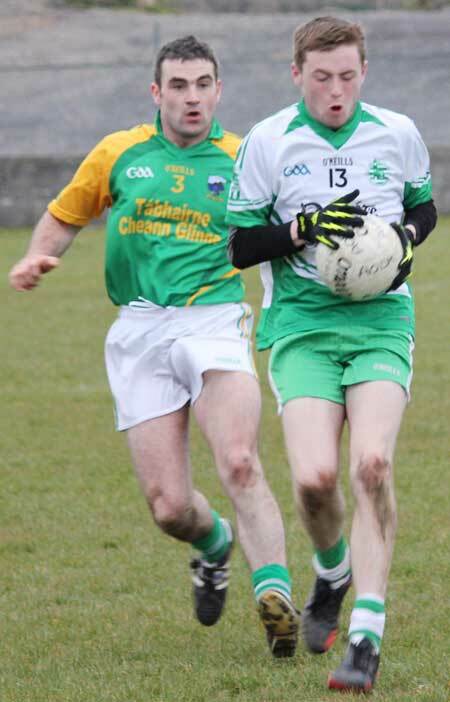 There was a very difficult wind in play and if it was blowing in any particular direction it was behind Aodh Ruadh in the first half. The Glen men were first on the score sheet though, with Daniel McBrearty finding his range with a minute and 50 seconds gone. Aodh Ruadh's response came five minutes later when David Dolan judged the bring to perfection to steer over a free from the right. Glen edged back into the lead when Kevin McNern did well to stay on his feet after shipping a heavy challenge from Kerry Ryan before floating over. 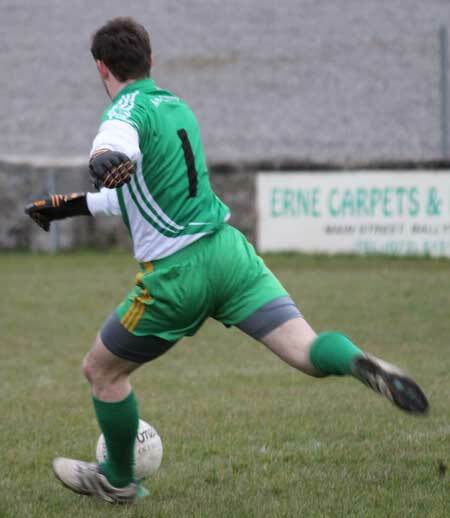 Ballyshannon were able to reply more or less instantly though when David McGurrin showed lightening reactions ahead of a neat point slotted over off the outside of the right boot. 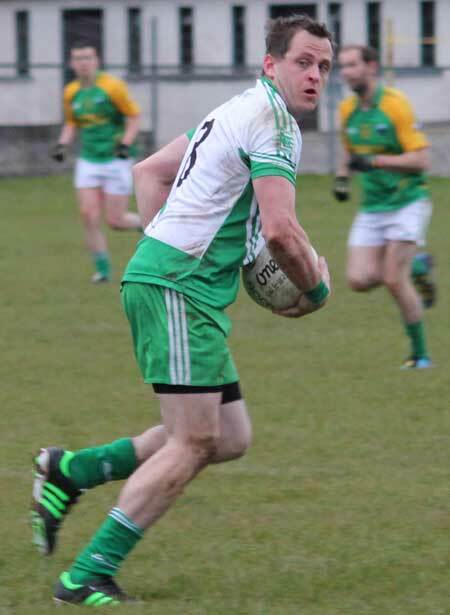 Ois�n McGinley was the most threatening of Naomh Columba's forwards, but it took him until the 17th minute to register on the score board. He was picked out by a beautiful long range pass and was left with a routine opportunity to convert. 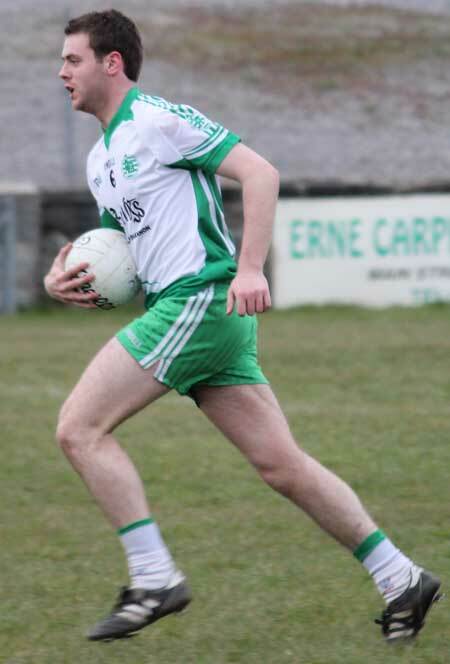 A Ryan McNern point made it double scores three minutes later, but Diarmaid McInerney clawed back the deficit to the minimum, breaking a long ball in down to himself, before driving over. 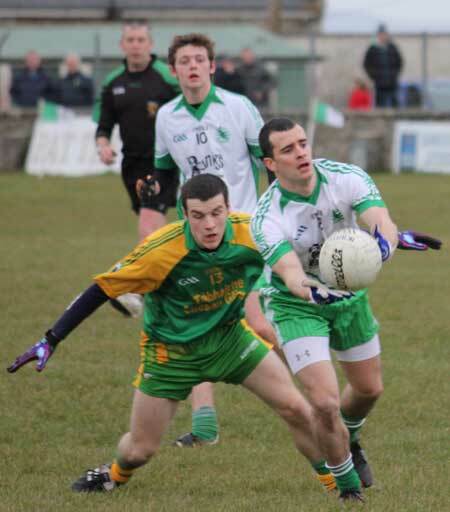 A crisp Gavin McGinley point took the margin out to two again a minue later, but Aodh Ruadh worked a rapid passing move from the kick out, with Stephen Ward at the heart of it, which finished with Donagh McIntyre in possession on the edge of the Naomh Columba area with a defender in close proximity. McIntyre held him off and finished his chance past Padraig Byrne with great authority to put the homesters into the lead for the first time in the game. A minute into first half added time Peter Boyle was called up to face an awkward 35 metre free. It was a tricky opportunity, but Boyle calculated his shot to perfection and sent Aodh Ruadh in leading 1-4 to 0-5 at half time. That score line probably didn't reflect the visitors effort in the first half and they set about making immediate amends in the second when Dermot Maguire knocked over his first shot of the game. Ballyshannon once again engineered a goal chance from a kick out. This time there were a few false alarms beofer Diarmaid McInerney finally managed to palm to the net while being man-handled by Padraig Byrne. That took the scores to 2-4 to 0-7 and the Ernesiders looked set to kick on for their third win on the trot. 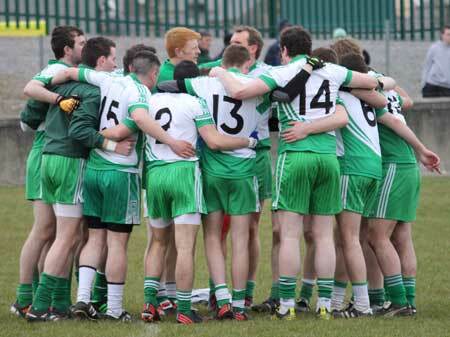 |Naomh Columba dug in though and began making their scoring chances count. First Gavin McGinley squeezed over a point from a tight angle. Then in the 37th minute Declan Maguire tried to break through for a goal shot, but was fouled in the process. The foul definitely took place outside the area, but Maguire had the cuteness to make sure he landed in the area. Corner back Martin Cunningham came up to take the penalty and make a superb job of it, sending Peter Boyle to his left and slotting to the right. Ballyshannon reacted well, James O'Donnell setting up David McGurrin to fist over and reclaim the lead. Unfortunately that score came in the 37th minute and Aodh Ruadh weren't able to trouble the score board again until the 61st minute. 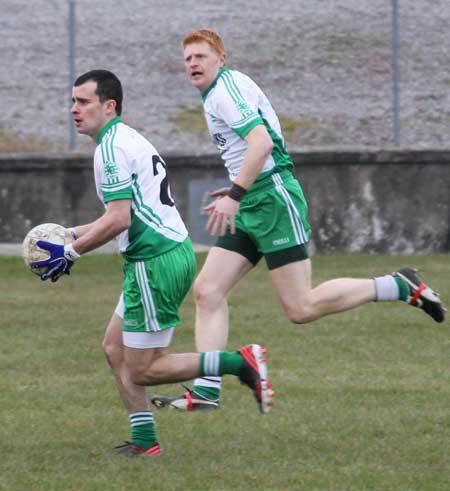 In the meantime Naomh Columba kept the score board ticking over with two points from Declan Maguire book-ended by scores from Ois�n McGinley. 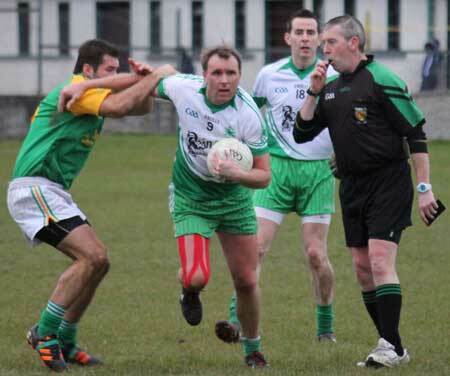 Anthony Boyle hit the final score of the game as Aodh Ruadh desperately sought something from the tie. Peter Boyle had the last meaningful opportunity of the game, but his shot from placed ball went high and wide on the left in the gathering gloom. 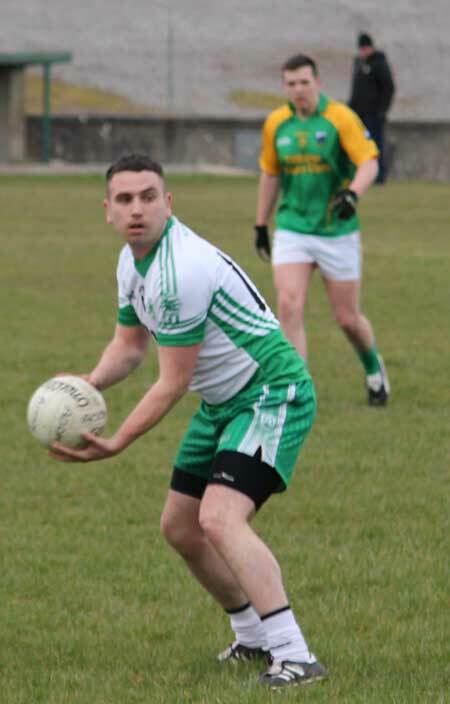 Two good points for Brendan Doherty's men, but a set-back for an Aodh Ruadh side who had been hoping to clinch their third win on the bounce. 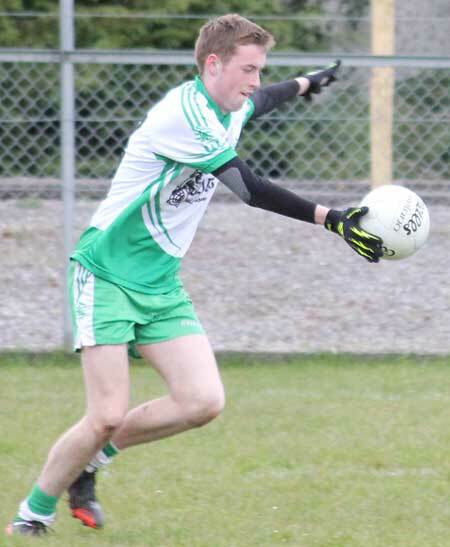 Ois�n McGinley did most of the damage, both as scorer and provider, while Naomh Columba were also given great service by their midfield, who steadily strengthened their grip in that area as the game went on. For Ballyshannon the forward line of Donagh McIntyre, David McGurrin and Diarmaid McInerney did well on the possession that came their way, but too often the ball was a of middling quality. Stephen Ward was a great presense in the first half, while Johnny Gallagher soldiered well through out. 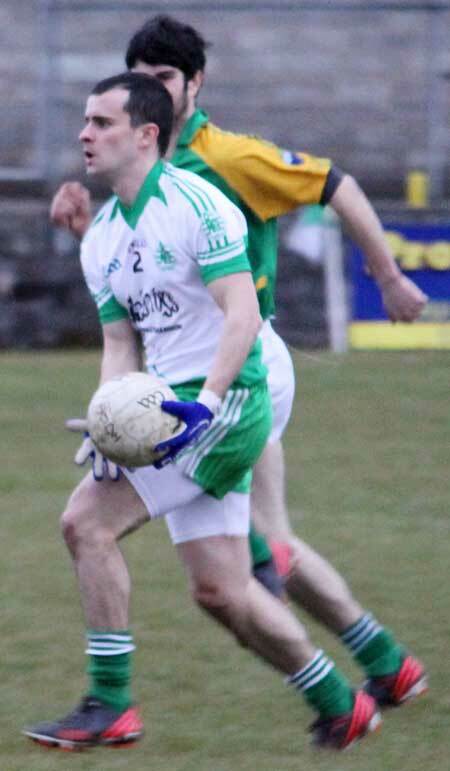 Aodh Ruadh now face the prospect of trying to get their promotion bid back on track with a win away at Fanad Gaels next Saturday. Substitutes: Ryan Granaghan for Niall Murray: half-time; Ciron Whoriskey for Kerry Ryan: half-time; Gary Carty for Ryan Patton: 47 minutes; Matthew Thompson for Donagh McIntyre: 50 minutes; Jamie McDonald for Diarmaid McInerney: 53 minutes; Niall Harley for James O'Donnell: 56 minutes. Yellow cards: Kerry Ryan: 22 minutes. Frees conceded: First half: 6 / Second half: 9 / Total: 15. Padraig Byrne, Barry Carr, Kevin Cunningham, Martin Cunningham (1-0 penalty); Padraig Ward, Michael Maguire, Damien McBrearty (0-1); Andrew O'Gara, Declan Maguire (0-2); Ryan McNern (0-1), Kevin McNern (0-1), Gavin McGinley (0-2); Stephen Jones, Ois�n McGinley (0-3, 1f), Dermot Maguire (0-1). Substitutes: Noel McGinley for Stephen Jones: 42 minutes; Padraig O'Donnell, Ciaran McBrearty, Colin McNellis, Padraig Cunningham. Frees conceded: Frees conceded: First half: 4 / Second half: 7 / Total: 11.